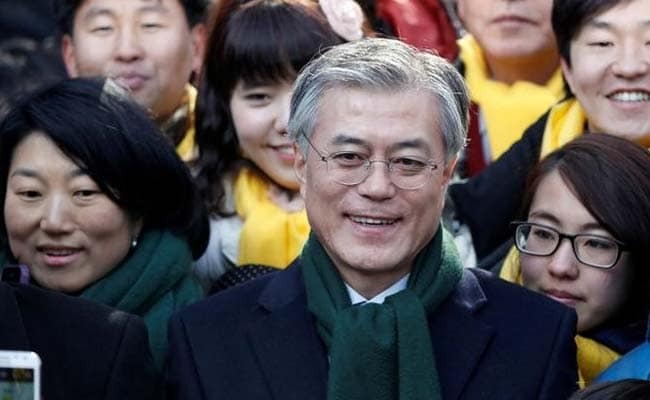 Moon, who lost to Park narrowly in the last presidential election in 2012, has criticised the two former conservative governments for failing to stop North Korea's weapons development. Moon Jae-in has criticised former governments for failing to stop North Korea's weapons development. SEOUL: South Koreans began voting on Tuesday to elect a new leader, looking to move on from a corruption scandal that brought down former President Park Geun-hye and shook the political and business elite to the core. Unless there is a major upset, liberal Moon Jae-in - who calls for a moderate approach on North Korea, wants to reform powerful family-run conglomerates and boost fiscal spending to create jobs - will be elected president. The vote will end months of leadership vacuum. Park was ousted on charges of bribery and abuse of power in March to become South Korea's first democratically elected president to be forced from office. She is in jail, on trial. Moon, who lost to Park narrowly in the last presidential election in 2012, has criticised the two former conservative governments for failing to stop North Korea's weapons development. He advocates a two-track policy of dialogue while maintaining pressure and sanctions to encourage change. A Gallup Korea poll published last Wednesday showed Moon with 38 percent support in a field of 13 candidates, with centrist Ahn Cheol-soo his nearest challenger with 20 percent. Moon told reporters after casting his ballot he had "given the campaign his all", and urged South Koreans to vote. Ahn, who voted earlier at a different polling station, said he would wait for the people's "wise decision". Other presidential candidates were also seen voting early in the day. Voter turnout stood at 5.6 percent by 8 a.m. (2300 GMT Monday), according to the National Election Commission. A decisive win by Moon will provide much-needed stability and is expected to improve market sentiment at a time when robust exports have supported a recovery in Asia's fourth-largest economy. The won <KRW=> is up nearly 7 percent against the dollar this year, while South Korean shares <.KS11> are trading at a record high as foreign investors feel confident about corporate earnings after South Korean businesses did well in the first quarter. South Korean financial markets are closed on Tuesday but will resume trade on Wednesday. The winner is expected to be sworn in on Wednesday, after the Election Commission releases the official result. The new leader is expected to quickly name a prime minister, who will need parliamentary approval, and main cabinet positions, including national security and finance ministers, which do not need parliamentary confirmation. The election is being watched closely by allies and neighbours at a time of high tension over North Korea's accelerating development of weapons since it conducted its fourth nuclear test in January last year. Pyongyang carried out a fifth test in September and is believed ready for another. U.S. President Donald Trump has vowed to stop North Korea developing a nuclear missile that can hit the United States. North Korea would be keen to see a Moon victory. Its official Rodong Sinmun newspaper said in a commentary on Monday the time had come to put confrontation behind by ending conservative rule in the South. "We as the same race should gather our strength to open a new era of independent reunification. To do so, the puppet conservative group's move to remain in power should be definitely crushed," it said. The U.S. State Department said Washington looked forward to continuing "close, constructive, deep cooperation" with South Korea's new president. "We will continue to meet all our alliance commitments, especially with respect to defending against the threat from North Korea," State Department spokeswoman Katina Adams told Yonhap News Agency on Monday. The new president will also face the challenge of defusing tension with China, which is angry about South Korea's decision to deploy a U.S. anti-missile defence system that China sees as a threat. Park had decided not to vote, despite having the right to do so because she has not been convicted, media reported. An official at the detention centre where she is being held declined to comment, citing her privacy. The polls opened at 6 a.m. (2100 GMT on Monday) and will close at 8 p.m. (1100 GMT).